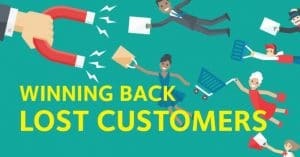 Home › Marketing Gold Nuggets › What To Do About Those Lost Customers? You outta hate – and I mean hate – losing customers. Entrepreneurs that I know absolutely hate losing even one customer. What are you doing to prevent that from happening? Do you have a plan to retain your current customer or, if you do lose them through no fault of your own, to get them back? When asked this question many business owners don’t have an answer or at least not a good one. You must understand the true economics of losing a customer! You NEED to get yourself highly motivated and passionately committed to invest aggressively in not losing customers! This will require accurately determining what a customer is worth and what the cost of replacing that customer really is. It costs 5 times more to get a new customer than it does to keep your current customer. Yes, you do have to invest in keeping your customers. You must decide how much you are willing to invest in NOT losing a “good” customer. Every year I become somebody’s lost customer. Many don’t even realize I’m a lost customer. I guess they just figure “gee, he hasn’t been in for a while.” If they even realize that I’ve gone missing. Every year, national companies and local shops lose me as a customer. I can’t recall even one ever doing anything proactive and significant about their loss. You should have what we call a customer retention strategy in place and a strategy to reactivate lost customers on a regular basis. A monthly newsletter should be a key piece of the puzzle for client retention, relationship building, and customer engagement. It’s also a great way to let your clients know you value them enough to invest in developing and sending them a newsletter each month. One of the biggest reasons consumers site for NOT going back to a business they were happy with IS… drum roll please… they forgot about them! Another reason among the top four IS feeling taken for granted by the business. A newsletter goes a long way in preventing either of those happening with your customers. What to do about those lost customers – invest in preventing them from becoming lost. Even that won’t prevent some of them from becoming lost even if you do everything right. We know that doesn’t always happen, but many are pretty good. The difficult thing about doing everything right is that we sometimes drop the ball and too often our customer doesn’t let us know, they just stop coming. This is why you should have a process in place for activating lost customers. When you can re-activate a lost customer, it’s much like getting a new customer. Keep in mind it’s best not to wait too long to try to re-activate a lost customer. The longer they are away, the more difficult it is to get them back.